I've visited Seattle's Elisabeth C. Miller in October, June, and now May. I have to say, in terms of the garden looking its best, May wins. 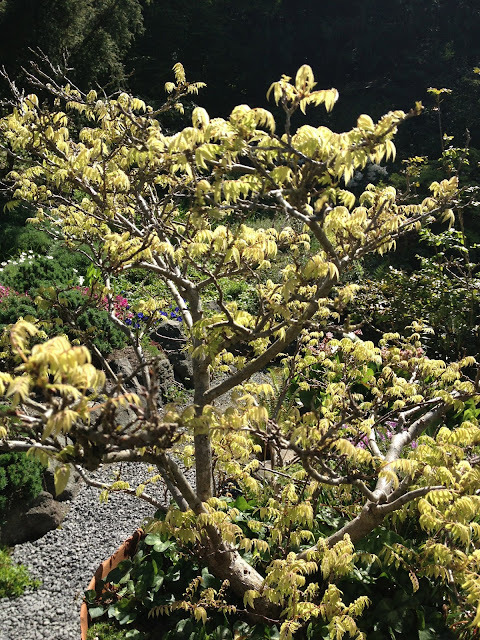 Spring ephemerals and many rhododendrons are in bloom, freshly unfurled fronds festoon a flood of fine ferns, and having a nice and sunny mid-spring day, the thrust of the growing season kicking into high gear was spine-tingling. An overall view of the garden. Our group of about 10 was guided by the curator of the Miller Garden, Richie Steffen. I think he literally knows every plant in the garden. 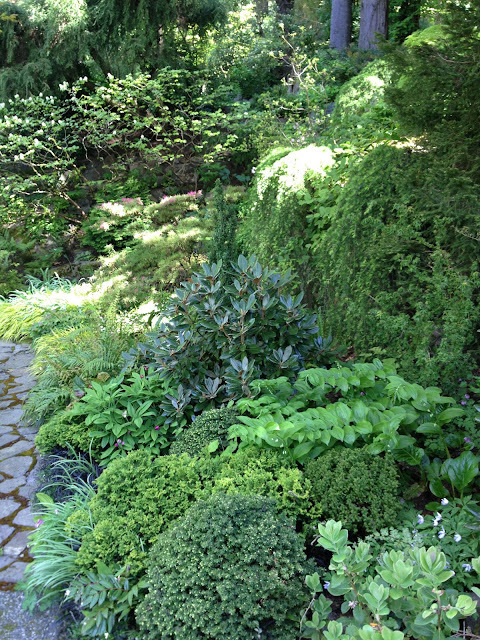 Heading into the dense, wooded area of the garden. I was amazed to discover we have a native fern that is evergreen and has gigantic 6'+ long fronds. It is called Woodwardia fimbriata or Giant chain fern. Its range is from northern California to southern British Columbia, making it hardy to at least 0 degrees F/-18C. 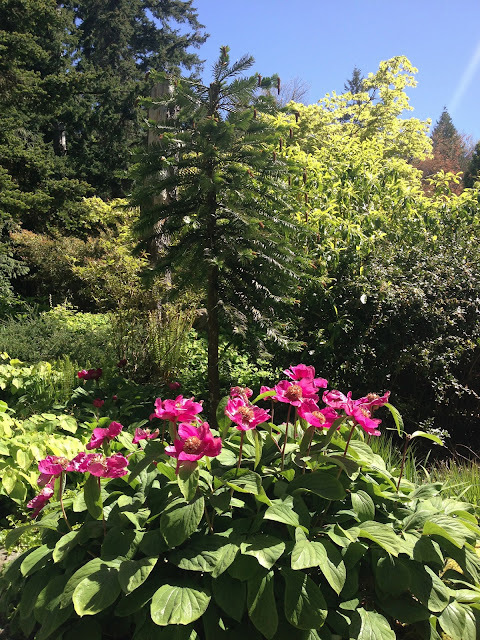 When woodpeckers started drilling into an old cedar tree next to Mrs. Miller's house, the garden's oversight board figured the tree was rotting from the inside out and decided to take it down. They had the trunk cut up in pieces and placed them around the garden. 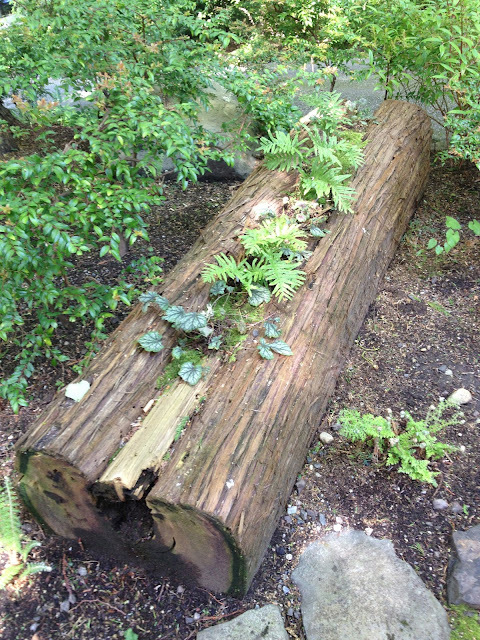 Just like in an old growth forest, the old rotting wood is making a new home for new generations of plants. Paris polyphylla, a lily relative, is strikingly thin and elegant. It's cousin, Paris japonica, has the largest genome of any living organism (Its DNA sequence 50 longer than a human). Just thought I'd throw that in. 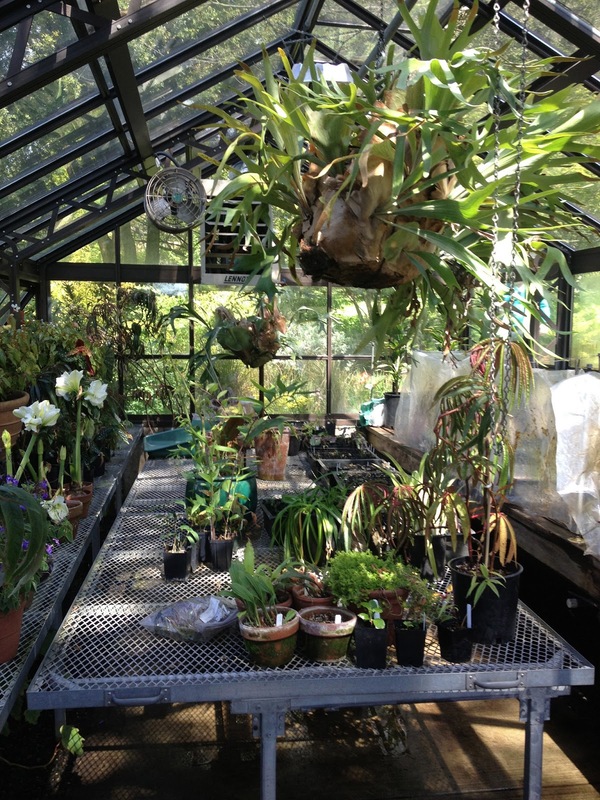 Plants of different shapes, textures, and shades of green create living tapestries. This is an evergreen fern called Blechnum novae-zelandiae. As its name implies, it's a New Zealand native. It makes a nice tall groundcover. Borderline-hardy rhododendrons seem to work well in pots, where they can be carted under cover should a wintery arctic blast strike. 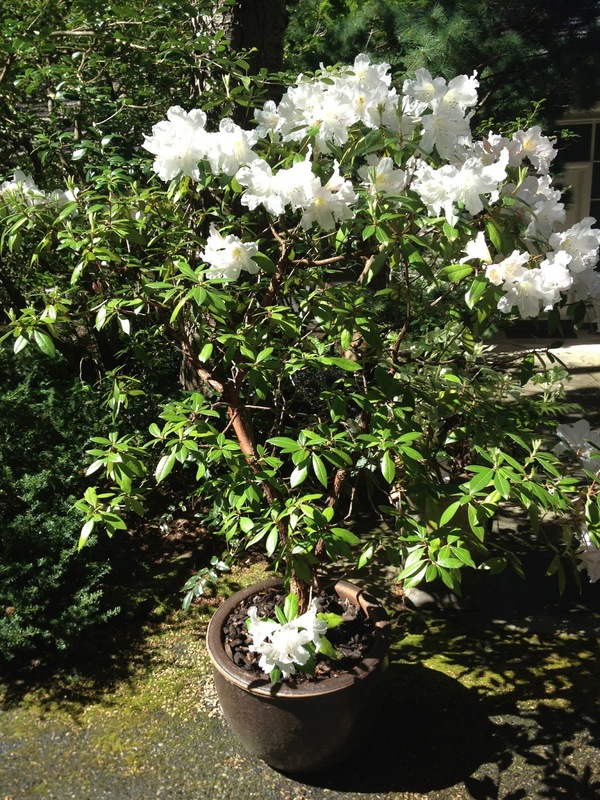 This cultivar is called Rhododendron 'Walter Maynard'. Its giant white blossoms are very fragrant. I believe the garden has about 20 of these placed throughout the premises, each growing in a pot so it can be carted to safety should winter ever turn ugly. Judging from the name, this hydrangea is a hybrid, but it was apparently collected by Dan Hinkley, who is a plant explorer and not really a hybridizer. 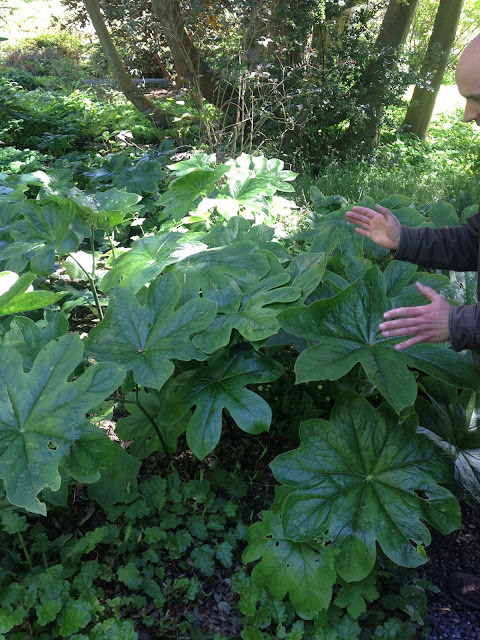 Of course the Miller garden is the type of place that would have mounds and mounds of Podophyllum delavayi. 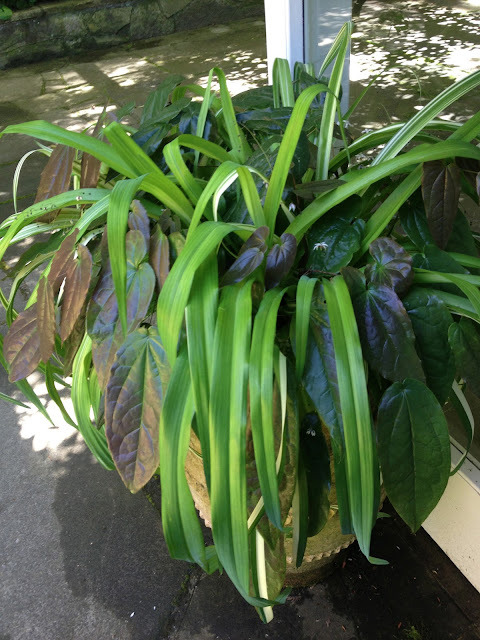 I've had many opportunities to buy this plant, but paying $50 for a root cutting is just not going to happen. Behind these peonies (at least I think they're peonies) is one of their larger Wollemi pines. According to Steffen, the Miller Garden has the largest collection of Wollemi pines this far north. Dicksonia antarctica (Tasmanian tree fern) in the background. I'm not sure what the plant with white flowers is. Could be a hardy orchid perhaps. And now for the best part. I saw how this papyrus was growing and suspected that it had overwintered in the ground. 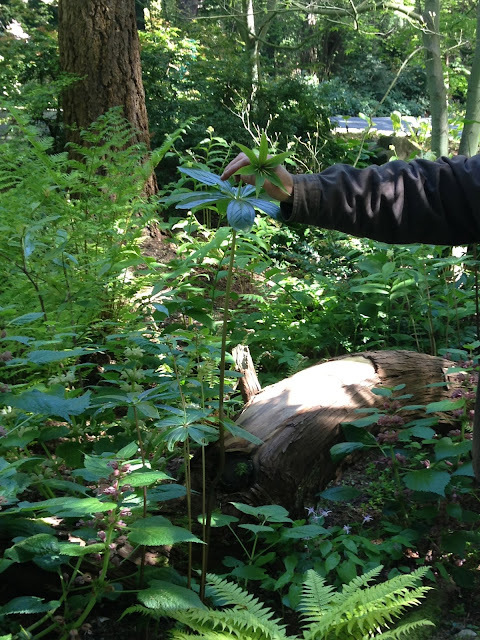 When I asked Richie about it, he said it was a hardy papyrus and had been growing there for several years. Right at that point, I heard the sound of trumpets echoing in the heavens as I entered into a new stage of enlightenment. Hardy papyrus? How did I not know about this before?!?!? They are in the genus Cyperus but the species name is unknown. To my utter amazement and forever indebtedness, when we finished our tour, I was handed a 1 gallon specimen to take home. Richie told me how to propagate it from leaf nodules...so at some point I just might have some to share! 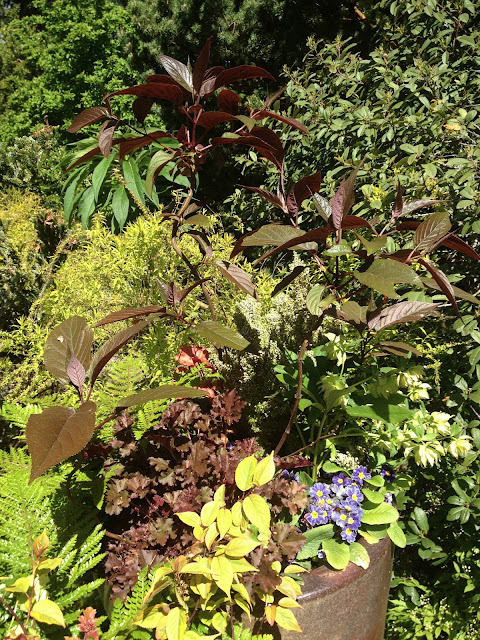 Now some bad news: The Miller Garden is already sold out for 2013 but check their website in September or sign up for a Northwest Horticultural Society class at the Miller Garden to try for a spot in 2014. With a bit of initiative, it's pretty easy to be one of the 500 guests allowed into the garden each year. Let's properly ID your Podos. Sorry, I'm too much of a plant geek to let you get away with this. HAHAHAHHA. Your first photo is of P. 'Spotty Dotty' and the second in the container is P. 'Kaleidoscope'. They both have P. delavayi as parents though. 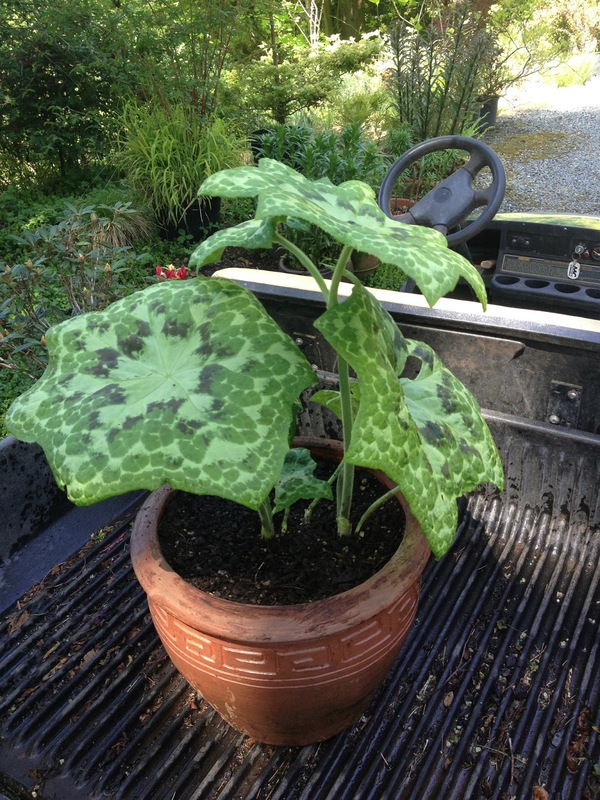 "Dotty" is the better plant of the two hybrids. I was at the garden recent and it looked so great! I'm glad you had a chance to visit! 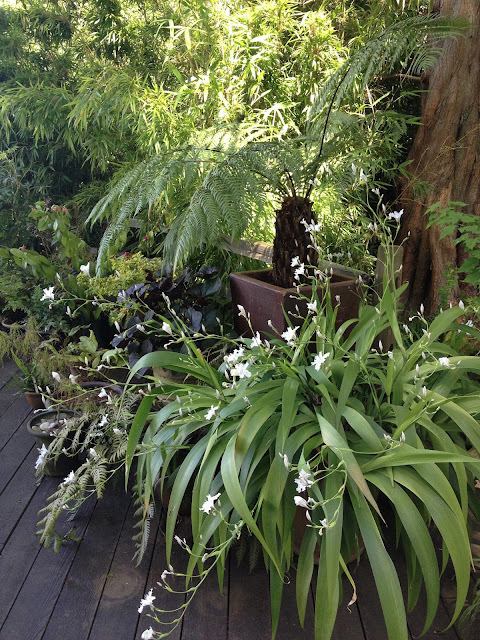 Much appreciated Riz...I have to remember there are people with horticultural degrees who read this blog! 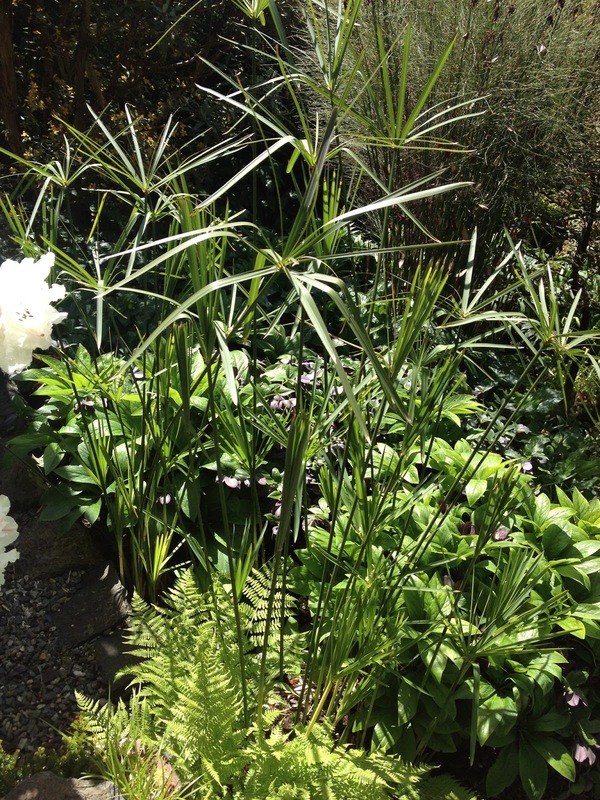 Could the plant with the white flowers in front of the tree fern be a bamboo iris, Iris confusa? It does look like it. Could very well be. I'm thinking that the white-flowered plant is Iris japonica. 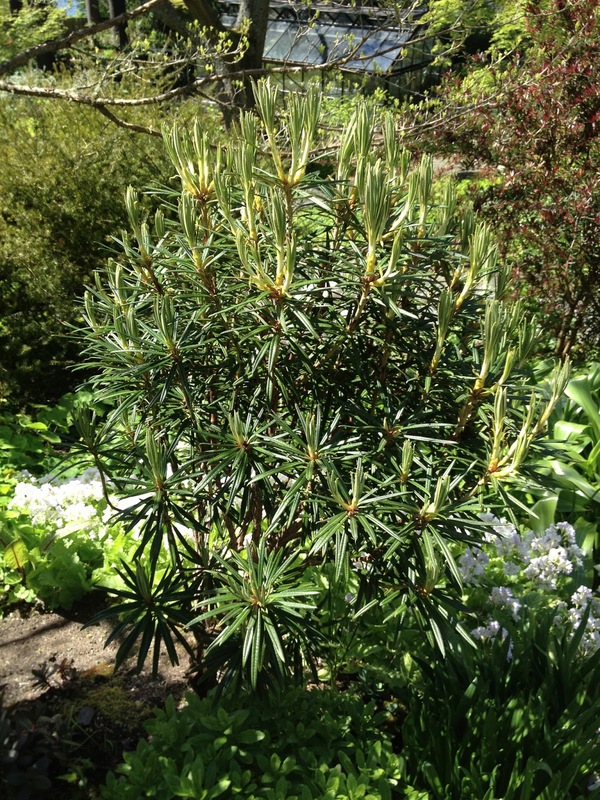 Nice evergreen foliage that is beloved of gardeners and slugs alike. There are less expensive sources of podophyllum delavayi like Keeping it Green Nursery, Dragonfly Farms (also now has Wollemia nobilis) and Far Reaches Farms. Thanks for again posting about the Miller Garden and the exciting news of a hardy papyrus!